We’d love your help. 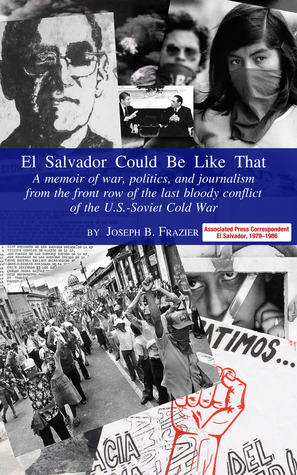 Let us know what’s wrong with this preview of El Salvador Could Be Like That by Joseph B. Frazier. Joe Frazier, a longtime veteran of The Associated Press, covered the bloody civil war in El Salvador from 1979-1986. He draws from his vast trove of articles written from the frontlines, interspersing the reporting of facts with personal stories—some funny, some tragic. Broad in its sweep, focused on the daily lives of the war's victims, Frazier's book is an important cont Joe Frazier, a longtime veteran of The Associated Press, covered the bloody civil war in El Salvador from 1979-1986. He draws from his vast trove of articles written from the frontlines, interspersing the reporting of facts with personal stories—some funny, some tragic. Broad in its sweep, focused on the daily lives of the war's victims, Frazier's book is an important contribution to to remembering the lessons and recording the history of this mostly forgotten conflict. From the author's dedication: "The wars that brought us together are forgotten now. So are the lessons they should have taught us. This book is a reminder of both." —Juanita Darling, Ph.D., assistant professor of International Relations at San Francisco State University, veteran Latin American correspondent for the Los Angeles Times. —Stephen Kinzer, International Relations, Boston University, award-winning New York Times foreign correspondent, author of Blood of Brothers: Life and War in Nicaragua and other titles. —Journalist and filmmaker Mary Jo McConahay, author of National Geographic Book of the Month, Maya Roads: One Woman’s Journey Among the People of the Rainforest. I covered El Salvador from 1979-1986, the worst of the war years, for The Associated Press. In addition to wartime coverage, I visited several times later for the AP, and after retirement took solo road trips down from Oregon in 2009 and 2011. My memoir is a ground's-eye view of the El Salvador war and of what it did to the peasants, the soldiers, the school kids, the union leaders, the shopkeepers, the fishermen and artisans, the parish priests - the everyday, unremarkable people who often wound up in unmarked graves and on the edit-room floor. It is also a look at the politics and economics and social history that underpinned the conflict. To ask other readers questions about El Salvador Could Be Like That, please sign up. I was disappointed that there wasn't more about Frazier's wife who was killed in El Salvador. I found her story to be very compelling. That said, any story about Salvadorans is always great. The Salvadoran people are generous, thoughtful & unique people; at least the poor and middle class are. If you plan to go to El Salvador, make sure you read this first! Astounding and, without a doubt, true. This was current events for me. Now it's history. Things they deny down there categorically, I remember reading about over and over in the less conservative rags in the US. And then there was the AP outlook. I followed it regularly. Nobody messed with those guys and their reporting. Joe was one of my favourites then, and this book proves he is still one of my favourites. We gnawed through mountains of spin and did the best we could. There remained for a short time a 1950s-style naivete that told us if the U.S. government was telling us something, it must be true. The facts on the ground quickly educated us otherwise (p. 14). Having lived a traumatic childhood in El Salvador, this book brought back a lot of memories. It is written in a biographical point of view and it envelopes the readers with facts and graphic descriptions of violent events. Very poorly written and barely edited. It was difficult to get through all the typos, and the smug/flippant commentary of the author about such sad topics was almost unbearable.